I am in awe of Amy Sue Nathan, and have been for a while. Her Women’s Fiction Writers blog, with its inspiring weekly interviews of authors, is a rich gift to all of us who love to read and write stories about women’s journeys. And now Amy’s own debut novel, The Glass Wives, is in stores! I am thrilled and honored to say that we are “book sisters,” having both been edited by Brenda Copeland at St. Martin’s Press. 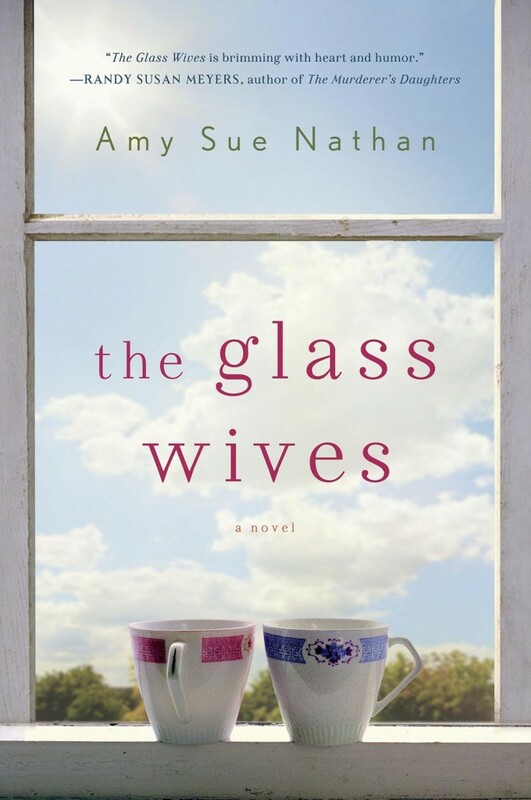 I’m reading The Glass Wives now (just started it last night) and am loving it. It’s my first official summer read! Woo hoo! How I have longed to begin summer reading! And look how pretty the cover is. (Scroll down) The bonus of this book is that you can look at that sublime, blue-sky-and-china-cup cover any time you want to. I have two copies of The Glass Wives to give away. Leave a comment below and tell me where you spent your best summer ever, or just say any old summery thing, and you will be entered to win. Best summers were spent on the beach in Ocean City, NJ. My best summer so far was just recently when I spent 10 days in London! A dream come true!! Growing up, I spent every summer in North Brookfield, Massachusetts, with my great-aunt and great-uncle. It was my second home, the place where my alter ego was born and ‘came of age’, doing the things I’d never dare to do back home. In addition to being the stomping grounds of my ancestors, dating back to the 1800s, it is the place where my own personal history was written. Even today, when I need to meditate in my ‘happy place’, my mind travels to the hot summer days and antic-filled nights in rural New England. I love summer the most of all seasons because it stays light out until after 8PM and it rains least in summer. My best summer vacation was at Myrtle Beach, SC with my husband. We just enjoyed sitting on beach or by the pool reading or surf fishing.Of course, there were also seafood buffets and long beach walks at night listening to the waves. I loved that we took family vacations to Colorado every year when I was young. I still love Colorado. Thanks for the awesome giveaway. My favorite summer was when we went to my Great Grandma’s house in the woods, explored, picked currents, fished….it was amazing! My favorite summer memories are of hanging out on the beaches of Lake Michigan. On the 4th of July it seemed like the whole town was down there waiting for the fireworks to be lit over the lake. We had bonfires, great snacks, and a fun time catching up with everyone. Would love to win a copy of The Glass Wives. Thanks for the opportunity! Best summer vacation I’ve had was to Hawaii with husband and the kids. The munchkins were old enough to appreciate the amazing chance to travel there and the whole trip was wonderful. But I’m still a homebody, and love hanging around town for the summers and soaking in the Phoenix heat. My favorite summers have been the past few ones now that my kids are old enough to play at the beach and the lake. I love watching them run around in the water and just spending time with them. Thank you! My favourite summer memory is from a few years ago when my husband and I took a two-week road trip to the US East Coast. We drove from Toronto to Philly (via Hershey! ), Atlantic City, Boston, Cape Cod, and Providence. It was great to see so many lovely places and enjoy each other’s company! Thanks for the giveaway! Please find me on Twitter @mrsmonnandez. Summer is a wonderful time to read while sitting on a porch swing. My favorite summer was when we lived in Kissimmee, Florida. We went to Disney World, SeaWorld all the time because we had yearly passes and I loved when we went to Pier 60 at Clearwater Beach! My favorite summers were always spent at home but being outside! I love summer in the pool. Floating in my chair reading. The Glass Wives is on my of summer reads! My best summers were when I was a child. I would take the bus into town to the library, check out a bag of books and head home. I would climb up into the tree in my front yard and read all day. I devoured Nancy Drew, many children’s classics and lots of biographies. Today, I live in sunny southwest Florida where I can have that type of scenario year-round. Ah, but life is good. Would so love to read your novel. It sounds fabulous. Thanks for the generous giveaway. My best summer memory is going to my Aunt’s house in Minnesota. They lived out in the country and we had such a good time! My favorite summers were those spent in the town of Swanage in Dorset, England studying and performing music. Such a beautiful town. I also discovered some of my favorite English authors there. My best summer vacation was a combination vacation and 35th anniversary gift from our youngest daughter. She decided we were having a mini vacation to Niagara Falls. She booked the hotel and acted as our driver from our home state of WV to Niagara. We did no driving the whole trip, just relaxed. We visited the Maid of the Mist and other local tourists attractions. We went into Canada and had a lovely dinner and did some sight seeing. Later, in Buffalo, we found an estate sale and I, an antiques dealer, responded nicely to the wonderful merchandise and took a lot of it home for resale. It was one of the most relaxing and loving vacations we have ever had and we owe it all to our caring, loving daughter. My best summers were spent with my oldest sister on the coast of Maine. She would have all of us sisters stay with her for weeks at a time. Great childhood memories of a peaceful little town on the coast. Summers lasted forever back then! My best summer vacations were the ones spent near the ocean. Whether it was at my parents rental in one of the many villages on Cape Cod or in a town on LBI. The splendid early memories of spending days at the beach after running down the giant dunes at the Cape and then satisfying that sweet tooth at the end of the day at the penny candy store will always warm my heart! Hi everyone, thanks for entering my Glass Wives giveaway; I really enjoyed reading about your summer joys! The two book recipients this time around have been notified. Stay tuned, I will do another giveaway soon.